Holzwarth, Hans Werner. Koons. Cologne: Taschen, 2015, p. 74. Champion, Julie and Nicolas Liucci-Goutnikov. Jeff Koons: La Retrospective: The Portfolio of the Exhibition. France: Centre Pompidou, 2014, p. 124. Koons, Jeff and Norman Rosenthal. Jeff Koons: Entretiens avec Norman Rosenthal. Hove, England: Thames & Hudson, 2014, p. 260 [French Edition]. Koons, Jeff and Norman Rosenthal. Jeff Koons: Conversations with Norman Rosenthal. China: Thames & Hudson, 2014, p. 260 [English Edition]. Blissett, Luther. “La jouissance du retour en enfance.” Beaux Arts editions December 2014, p. 54. Obrist, Hans Ulrich. The Conversation Series 22 : Jeff Koons. Cologne: Verlag der Buchhandlung Walther König, 2012, p. 89, illustrated. O'Brien, Glenn. "Andy Lives!" Departures November/December 2009, p. 173, illustrated in color. Rappolt, Mark. "How does Jeff Koons do it to me?" Art Review September 2009, pp. 16, 98, illustrated in color. Lewis, Ben. "Popeye the Eye-Popper." Evening Standard [London] 2 July 2009, pp. 34-35, illustrated in color. Glover, Michael. "King of comic relief." The Independent [London] 1 July 2009, p. 15, illustrated in color. Clark, Liat. 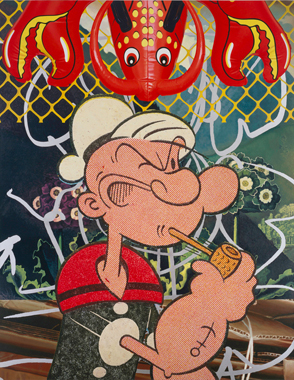 "Pop Art Popeye." Matchbox July 2009, p. 56, illustrated in color (with the artist). Philips, Sam. "A Real-Eye Popper." Royal Academy of Arts Magazine Summer 2009, illustrated in color, p. 17. Teeman, Tim. “The Conversation: Jeff Koons.” The London Times 13 June 2009. Raine, Craig. "Looney Koons." Evening Standard 4 June 2009, p. 25, illustrated in color (detail). Hoyle, Ben. "Art's showman makes a crunch debut with images of Depression." The London Times 11 May 2009, p. 15, illustrated in color. Azimi, Roxana. "Portrait: Jeff Koons." Le Journal des Arts (no. 286) 5 September 2008, p. 31, illustrated in color (with the artist, detail). Holzworth, Hans Werner, ed. Jeff Koons. Cologne 2008, pp. 4, 519 (detail), 522 (installation view), illustrated in color. "Der Mann Aus Marmor" GQ [Germany] September 2007, p. 78, illustrated in color (with the artist, partial). Seymour, Stephanie. “Jeff Koons: Art Made in Heaven.” Whitewall Fall 2007, p. 125, illustrated in color. Canarutto, Sarah Cosulich. Jeff Koons (Supercontemporanea series). Milan, 2006, pp. 92-93, illustrated in color. Heartney, Eleanor. “Jeff Koons at Sonnabend.” Art in America May 2004, p. 155. Yablonsky, Linda. “In the Studio: Jeff Koons.” Art + Auction March 2004, p. 41.